The Personnel Dashboard consists of two separate tables: the Personnel Count by Location and by Organization dashboards. The Personnel Count by Location dashboard lists each location along with its related systems. The Personnel Count by Organization dashboard lists each organization involved in a particular work effort and the total number of personnel currently involved with each organization. The OMS Modify Personnel Page tracks employment requirements, ensuring proper training and other required documentation and certifications. 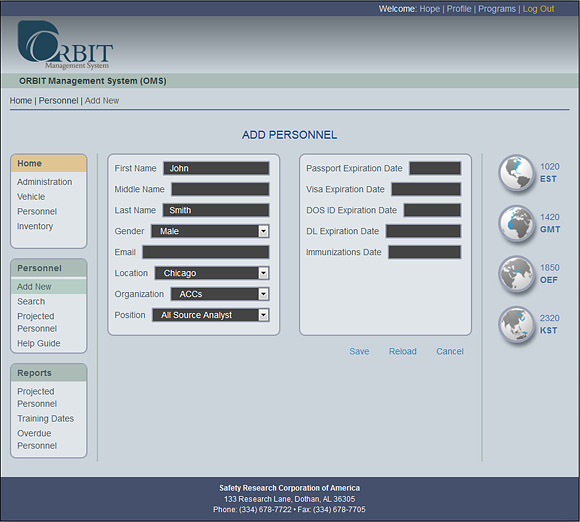 The ORBIT Management System tracks training requirements determined by the customer. Requirements can be tracked by check-off, date or short entry and can generate predetermined alerts to ensure all requirements are met.